Thousands of people involved in vehicle accidents across Texas have trusted our firm. We put our expertise to work for you quickly and aggressively so you can focus on recovery. We're a sophisticated law firm with the staff to handle large cases. We go beyond simply getting you through the process. We work with you and your family to get to the root problem and make sure you get the help and support you need. The Law Office of Chad West is your neighborhood firm dedicated to protecting and fighting for the rights of our clients since 2010. We're a small boutique practice comprised of a full staff to handle cases of every size. The Law Office of Chad West is recognized throughout the Dallas - Fort Worth area for integrity, dedication, and effectiveness. As a Dallas personal Injury Lawyer, Chad is proud of his firm’s dedication to helping those who have had personal injury through wrongful conduct of others. The Law Office of Chad West focuses on severe accidents and other personal injuries that can leave lasting effects on clients. His firm's aggressive and skillful advocacy ensures that his clients receive justice and the compensation they deserve. Whether obtained through a jury verdict at trial or a fair insurance settlement, Chad’s firm is diligent to advocating and fighting for his client's rights. At The Law Office of Chad West, our clients always come first. There's no case too large or too small for us. By taking on fewer cases at a given time, our firm has more time to dedicate towards learning every detail of your case and figure out the best plan of action to take. They do what it takes to get the best outcome for each client they represent. Fighting for you and informing you of every step is what they value. Preparing each case as if it is going to trial ultimately results in successul outcomes without having to go through the trial process. Each case is important to The Law Office of Chad West, which is why they make an effort to prepare each case for trial. It gives it the necessary attention for the best possible outcome. The Law Office of Chad West has a dedicated team of legal assistants, attorneys, and paralegals ready to help guide you through each stage of your case. They are helpful and willing to do what it takes to get successful results. They are informative through and willing to answer any questions about the case. Chad helped me seal my record. His office handled my nondisclosure really fast. Veronica, his paralegal, is amazing too. In consultations with the lawyers from this firm, we were given honest and accurate information with a lot of options to decide what was the best for us. They explained everything in a way we could understand and work around our schedule. All in all, it was a really good experience. They are very genuine and helpful. Chad West, PLLC helped me during a very stressful time. I was hurt by a negligent driver and had to endure several treatments. He was attentive and very supportive throughout the entire case. In fact, when things got shaky he was the first person to help me relax and honestly if it wasn't for him I don't think I would have gotten the results that I did. You'll know when you walk into Chad West's office that this guy isn't your typical run of the mill attorney. He's a down to earth guy just wanting to help fight for your rights and get you the compensation you deserve. Fill out our contact form or call us directly to set up your free initial consultation. Client faced 5-99 year prison term. DA’s original offer was 20 years prison. Plead client to 5 years. Dismissed sexual assault. Eligible for parole in 18 months. Dallas County case. Case dismissed on 2/10/2016. Client and his boyfriend got into a physical altercation after drinking. Client arrested and charged with assault. Case dismissed on day of trial. Client rear-ended another vehicle. Alleged BAC was .28 (over three times the legal limit). Blood evidence suppressed due errors in search warrant affidavit. Not Guilty jury verdict. Pro bono court appointment. Case dismissed the same day case was appointed. Chad has shown that hard work, respect and dedication can result in awards and recognition in the community and nationally. 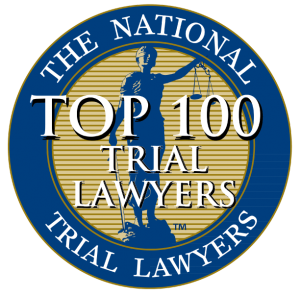 Chad West received Top 100 Trial Lawyers 2013 by The National Trial Lawyers organization. 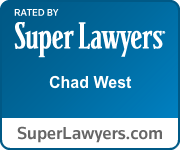 Chad West was recognized as a “Texas Rising Star” by Super Lawyers (a Thomson Reuters service) in 2011-2016. Chad West was named "Best in Dallas" from 2014-2016 by D Magazine. Chad West and his highly skilled team are dedicated to fighting for the rights of the individual regardless if it is a serious personal injury or an involved criminal case. This extremely devoted team of prestigious lawyers will fight for and obtain a fair resolution for their clients. They are always prompt with their clientele communication and will be available to answer questions regarding your case. The Law Office of Chad West will navigate the legal channels of your case as they bring their sophisticated team of attorneys, legal assistants, and paralegals to share in the operation of laying the course for your precise case. Chad West and his team welcomes you in with neighborhood charm to the office and the quality of an established law firm who will fight for you.